CONCRETE TEST HAMMER Type ND LD CO 550.4S Digital Test Hammer Original Schmidt Switzerland ASTM C 805 Features Specification Type DIGI Schmidt 2000 DIGI Schmidt 2000 New rebound measuring sensors microprocessor for rapid reproducible results plus resolution unattainable with older manual models. Hammer connected to control display via cable. Digital display of strength values mean value and standard deviation for preset number of measurements. User select menu for hammer impact direction and desired engineering units psi MPa kg cm2 or N mm2 . Indicates specimen size type for which data predicted. Measuring range 10 to 70 N mm2 compressive strength. Concrete testing with the Original Schmidt test hammer is the most frequent used method for non destructive concrete testing worldwide. 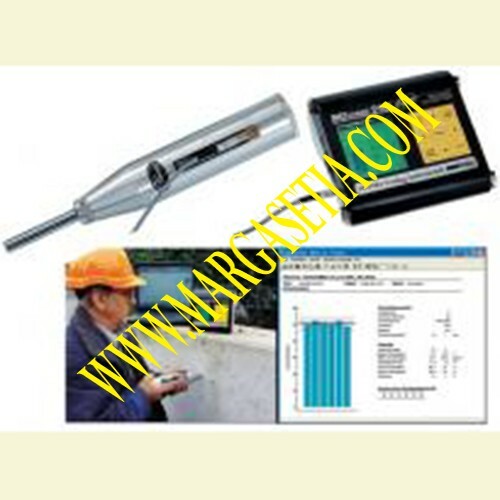 For every demand and specific test application Proceq offers the right concrete test hammer. Original Schmidt concrete test hammers are available in models with different impact energies in order to meet the needs to test a wide range of material types and sizes. Our types N NR L and LR are best suited and specially developed for assessing the quality and compressive strength characteristics of concrete with the range of 10 to 70 N mm2 1 450 to 10 152 psi . Versions incorporating paper chart recorders LR and NR can automatically register the rebound values on a paper strip chart. Proceq s type ND and LD Digi Schmidt test hammer measure the rebound values through an electronic method and allows the direct reading of the test results in digital form.